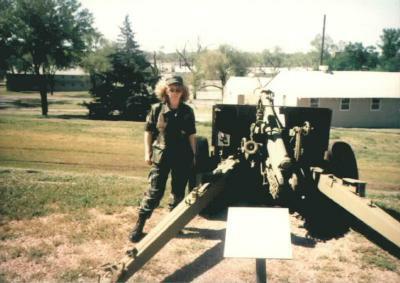 Bridget visits Ft. Sill, Okla.
Spring 1985 ~ Along with the rest of her unit [not shown], the 145 Public Affairs Detachment, Bridget Smith visited Ft. Sill, Oklahoma for weapons qualifications with their .45 handguns and gas mask training. I don't remember ever getting to the gas mask training, but the summer heat we endured sure was enough suffering. Military weapons qualifications was not a big deal because in her family the custom was always to make sure each child growing up knew how to fire the loaded shotgun that was always stored propped up behind the front door. No one ever had to use it, but it was comforting to know it was there in case we needed it. As part of our visit to Ft. Sill, Oklahoma, we received a fun reward: A visit to an unique military museum. 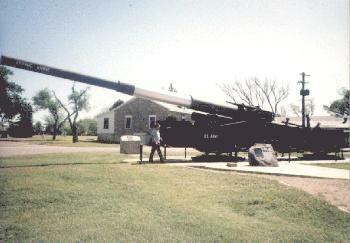 A fellow soldier took Smith's photo standing next to this Howitzer ~ just one of many large guns on this official Artillery Walk. Smith has always had a penchant for history, all eras. So, this stop was appreciated. A really big item on the walk was The Atomic Annie! It was a major highlight of the outdoor tour. 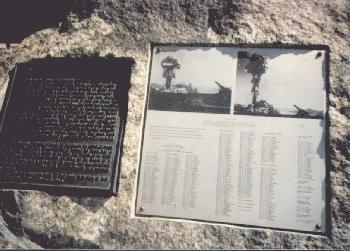 I took these two photos of that exhibit not knowing that one day in the future my friend and fellow veteran, Keith Whittle would want these photos for the Atomic Veterans History Project partly because he corresponded with the daughter of one of those who served at the tests where Annie was used. 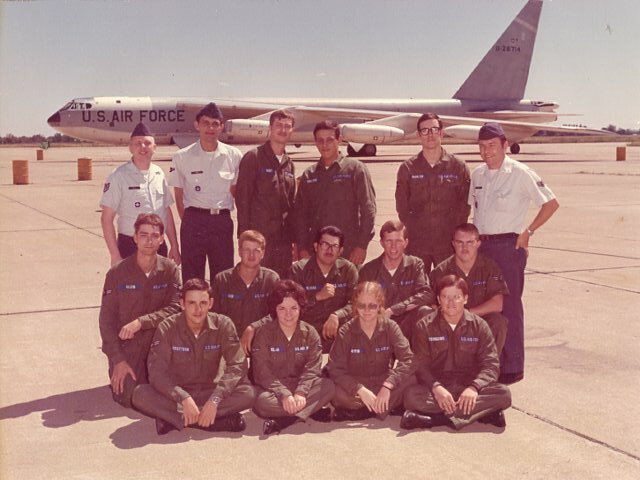 Digging Far Back into the Past... July, 1974 ~ Rantoul, Illinois ~ Chanute AFB, Aircraft Maintenance School. Me, sitting on the tarmack in front of the B52 we trained on there. It was a three month course. I graduated with high marks, enough to make expectations at my permanent party base unattainable at five-foot-one-inch tall. I'll bet you can guess which one I am. Hint: I'm blonde haired with glasses. 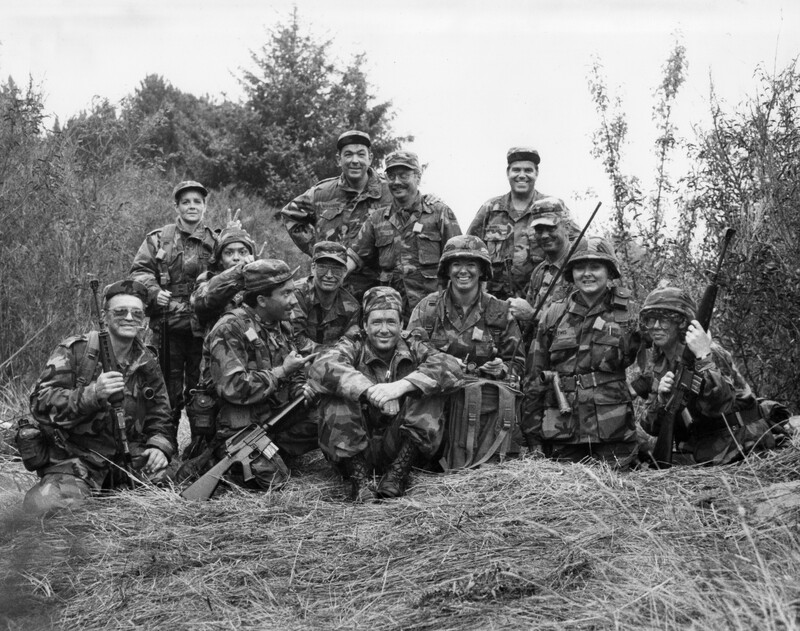 A little closer to now: My time in the Oregon Army National Guard was with the 115th Public Affairs Detachment, Salem. We were all sent to Camp Rilea on the coast for a few days to train on how to dig fox holes (I'm standing in one!) and other military skills. Can you tell which one I am? Oh, what is that in my hand?, We practiced how to survive wet nights and don gas masks in record time, and put on the rest of the suit. While we're at it, let's all write up a story and take photos of our journey. It's what Army journalists do. At a later time, I'll hope to write up the names of all these fine folk in this photo. The awesome photo journalist, Specialist Bob Serra, front and center, is the one who posed us all and set the camera to do a timed shot, tripod and all. The fellow to the left of him with a side view and a finger pointing is Leo Mora, a fine journalist with an even keel. To his left, SSG Karl Sloan, was our acting first sergeant. In case I didn't say, I'm the one on the far right and standing next to me, on the left is Maj. Susan Lewis. Thanks, Bob Serra, for taking this photo that I've forever been grateful to have as a memory of our time training in the sand. Boots are never so heavy as they are in sand. I learned that this trip. August or September 1987, time approximate for now. Before leaving Oklahoma, I was graduated from the University of Oklahoma with a BA in journalism and a BA in political science (concurrently, December 1982). After working a while at Norman Cable TV I began working for the Public Affairs Unit in the Oklahoma Army National Guard. Personnel branch had me as a clerk for six months. Civilian jobs were few and I wanted to seek my fortune where the big trees grew. With my constant companion, I traveled to Oregon from Oklahoma to find a new home. I am grateful for the opportunities that this unit offered me. Thank you so much, Maj. Susan Lewis, et al. April 1986, I arrived and asked for a spot in their unit. She made it happen and I'll never forget it. In the future, I plan to write more about my time in the Army National Guard.